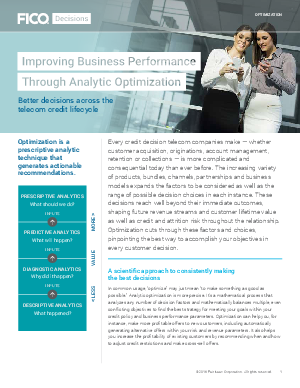 > FICO EMEA > Ever Wonder How to Make Better Decisions Across the Telecom Credit Lifecycle? As telecom markets become more saturated and competitive, your customer decisions must become more precise. As regulatory oversight expands, they must be demonstrably fair to consumers and explainable to regulators. Across the credit lifecycle, these more targeted decisions should be aligned with regulatory requirements. Download the Product Sheet and help your company drive performance improvements by making predictably, consistently better decisions across your credit lifecycle.